Books are not just parchment and ink. Books are not just words strung together, servants of the author's whim. Books are not merely there to teach or even just to be read, but are living, breathing aparati from which any characters may be plucked and drawn into our world, if only in the right hands, by the right tongue. Or so Inkheart will have you believing. As a child of about 11 or 12 I believed that by reading you saw not only into the author's soul, but into a world secluded, preserved, as if you had dipped your face beneath the surface of a pond to get a better look at the colonies of stones and reeds in the riverbed. I think, perhaps, I got the idea from a passage in The Book of Three where Taran and his friends are crossing The Black Lake and are suddenly sucked into the depths as the lake turns into a swirling black whirlpool and just as Taran thinks he has drowned, he awakens in a grotto where King Eiddileg has his kingdom. Every book was Atlantis to me. But it wasn't just that. There were moments, especially when I started on the Redwall series, that I would come to particularly gruesome or enchantingly beautiful or heartsickeningly romantic passages and I would catch myself, in the darkness of my nightlight, reading aloud as if my toungue could stir the dust into action and project the vivid images of my mind into the air before me. Childish, perhaps, but I still catch myself doing it. Having read Inkheart I suppose I should count myself lucky to not have the gift of literary manifestation. 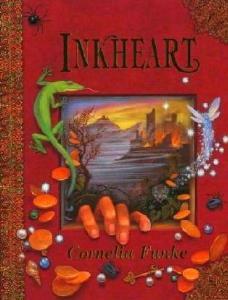 I first heard about Inkheart when I was watching the previews before another film on dvd. I wasn't entirely keen on the trailer, but Brendan Fraser was in it which made me happy. Then one weekend over the summer I was staying with my aunt and she had rented the film for my cousins. Recalling the trailer, I took time during that dvd's previews to wikipedia it. Turns out not only is it all about books, but it was a book to begin with. Fascinated at the its German origins and the fact that it's the first in a 3-part series, I made a note to seek it out, assuming I liked the film at all. I did like the film. Quite a bit. And it wasn't just my silly crush on Brendan Fraser, nor my love for Jim Broadbent and Helen Mirren. The story was special and very reminiscent of many of my childhood favorites. And then there was Paul Bettany. I felt, on seeing him as Dustfinger, that he was the perfect choice for him -- and this was before I'd read the book, or known much about it. Paul Bettany just pulsed to the tune of "I am your literary vision." And it was Paul Bettany as Dustfinger that made me know I had to read the book. That being said, I finally picked it up, and I can happily say that the film stays true enough to the book that I have no real complaints. There are moments, as in any adaptation, where they've cut corners or elaborated to make the audience get closure or perhaps to visually stimulate a little more. But that's the beauty of the book for me, that it IS so visually stimulating. And I was right. Paul Bettany IS Dustfinger. It's uncanny. I was a little disappointed that they'd gone with the Jim Broadbent end of the spectrum for Fenoglio - while I read it, Fenoglio looked more like Larry David. And I love Helen Mirren, but for one thing she's the victim of one of the elaborations of this particular film, but also she looks perfectly fit and capable whereas Elinor is supposed to look like a book addict. She's supposed to be a little chubby. Not Helen Mirren. Reading the novel made me realize what it was about watching the film that made me think of my other literary favorites. The film just kind of throws it all at you and hopes you stick along for the ride. The novel guides you. Every chapter is a new quote that almost outlines what will happen. Quotes from Peter Pan, The Neverending Story, The Princess Bride, The Jungle Book, books that I've read and books that I relate to. Not only that, but The Neverending Story The Princess Bride and Peter Pan are the backbone of Inkheart's frame. In The Neverending Story, Bastian gradually reads himself into Fantasia (the book, in that case, is far more detailed than the film. In The Princess Bride we've got a multilayer issue of the author addressing us and claiming an elderly grandfather who read this book and blah blah blah it's not really important, but in the film Peter Falk makes it all very realistic for young Fred Savage. Peter Pan is the most directly-addressed book within Inkheart in that Tinkerbell ends up playing a role within the story, but even the original is about fairy tales coming true. Wendy tells the stories to her brothers and on an acid-trip-related note, Peter Pan shows up with his fairy and flies around the room and takes them to Neverland and before we know it Wendy is old and regretting her youth but apparently still doing acid because Peter shows up again. Inkheart ties all of this together into a beautifully woven story about lost love and about treasuring books which, in the end, is what I'm all about. Books are very very powerful things, often with minds of their own. It is important that you treat them with respect and care, and don't go reading them aloud too loudly. If you happen to read a book out loud and begin to smell the sand and heat eminating from its pages, it's time to take a break and then procede with caution, lest you read out one of your villains and then where shall you be? And who shall have taken that villain's place in the world of the novel?